Monique Glasby: Eeep. ... I Started A Youtube Channel! Eeep. ... I Started A Youtube Channel! It all began with the binge watching of make up tutorials. And then suddenly, I was a Youtube obsessed Demon. For as long as I can remember I've kept up to date with the likes of Lauren Curtis, Shani Grimmond, Desi Perkins, Patrick Starrr, Jefree Star, Nikkie Tutorials, Make Up By Michael Finch & Chloe Morello. (Just to name a few). I've watched them grow, watched them laugh, watched them cry and watched them perform facial expressions I didn't even know were possible. (Yes Shani & Michael, I'm talking about you). But whilst I've been watching their every move, I've also been secretly envisioning my moves. So on that fateful day when I clicked "confirm order" on eBay, I decided that I would tackle my Youtube dream. The ring light came first. Then I took a break from Youtube for a little while. I talked myself out of it, didn't make time for it & just kinda gave up on myself. Trying something new is always scary. We learn to ride a bike on 4 wheels first. We learn how to swim by dipping our toes in the water and getting a feel. I just had to dip my toes in and get a feel. I set up my camera in my room and did a practice shoot. No lights, nothing. Just me, my make up and my camera. It was shocking. The lighting was off, my camera was below par (sorry MacBook) and you couldn't make out my nose from my eyeballs. But I felt like it was right. So then I took over my sisters old room and set my lights up. But what camera to use?? This was the big problem. See my parents had a Cannon 70D however I didn't like the picture quality or the way it showed the make up, and there were waaaaaay too many buttons for me to work out how to change that. I did some scrolling through other Youtubers channels and came across the Sony A5000. It's amazing. Yes it's a vlogging camera but for me, it's my favourite. So for a few weeks, I saved my pennies and finally bought it. Now my set up was complete. My first video was a failure. I absolutely hated it. I felt like I had such high standards from watching other Youtubers that it had to be perfect. No one is perfect. Perfection is boring. So I kept striding on. Video 2 was amazing. My best one yet. 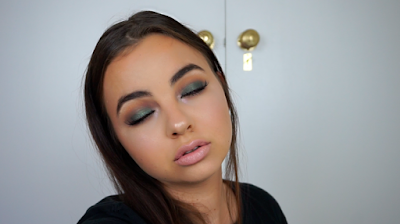 It was actually the first video on my channel - the Olive Smokey Eye with the Violet Voss Palette. I taught myself how to edit and how to also make it short enough to be supported on Instagram. The challenge of finding the right music came next, but thanks to copyright free Youtube channels that provide free music for a small fee (a shout out in your description), I found my jam. It hasn't been an easy journey. I filmed 2 more videos after this one and hated them both. Was I being too critical? Yes. But that's okay. It's a great learning lesson for me. 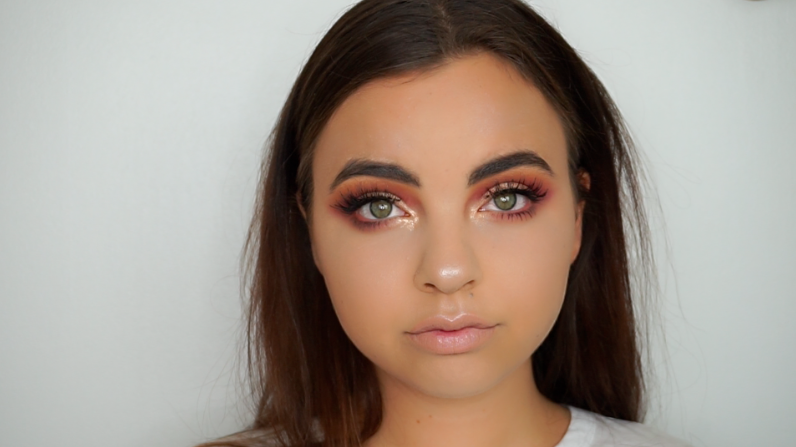 My Valentine's Day tutorial is my favourite video yet. I actually only have 4 on my channel at the moment, so it's not like I'm picking from millions. It was so crazy being able to see myself on Youtube. At first I was so embarrassed. I released the video on a day when I didn't have to be at work and I made sure no one on my Facebook, Instagram or Snapchat following knew about it. I wanted it to be a secret because I didn't want people to talk. But then I realised - why hide my truth? This is who I am and who I want to be. Maybe I'll wake up tomorrow wanting to be a gardener or a world renowned chef. But for right now, this is my passion. This is me. So I shared it with my family and friends. It was so so crazy. But it set my soul alight. People I hadn't spoken to in ages reached out to congratulate me. Even if I hadn't received support or praise, I would have been so happy. I am doing what I love to do, and if it feels right to me and I'm happy, then thats all that matters. If you have a dream, go for it. Don't wait for it to come to you. And remember - you are your biggest support. You don't need 1000 likes or 5,000,000 subscribers. If it feels good and it's fun, that's the greatest thing in the world!